(Northfield, MN May 2013) – Northfield, located in southern Minnesota — known for its appreciation of music and history — has become a travel destination within the Midwest sought out for its authentic experience. The Vintage Band Festival, August 1-4, will be the highlight of the summer as it welcomes re-enactment bands from across the United States and abroad to dust off their horns and old sheet music and bring music to life — in all its glory — from days gone by. The international festival boasts 100 concerts at outdoor parks, performance stages, dining establishments and pubs in the picturesque river town of Northfield and at a multitude of concert sites in nearby communities. 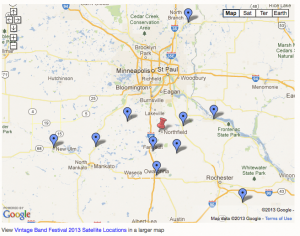 Find a full schedule of “living history” performances, auxiliary events and attractions, plus a sample travel itinerary for discovering more treasures in southern Minnesota, at vintagebandfestival.org. The Dodworth Saxhorn Band from Ann Arbor, Michigan, plays patriotic airs, orchestral transcriptions, marches, quicksteps, and ballroom numbers such as quadrilles, waltzes, polkas, gallops and schottisches. The band was a major influence on the New York music scene in the 1800s, performing at concerts, balls, social events, political rallies, and U.S. presidential inaugurations. The 1st Brigade Band, from Watertown, Wisconsin, dressed in navy blue uniforms, dates back to 1864 when eighteen men from the Brodhead Brass Band enlisted in the Union Army as the Band of the 1st Brigade, 3rd Division, 15th Army Corps. They served under the command of General William T. Sherman. After locating and restoring dented and broken instruments and reconstructing torn part sheets, the band continues its musical legacy from 150 years ago. Now you can listen to music that Abraham Lincoln, Jefferson Davis, Generals Lee and Grant, and their contemporaries heard in the day. Nineteenth century brass bands have been described as having sweet and mellow intonations, but to have survived and flourished in a time of great conflict within our country, the music seemingly served a broader/more brash purpose … that dignified the morale of its people during an era of clashing dissonance. The country battled with internal strife as the U.S.-Dakota War of 1862 made its tragic mark in Minnesota’s own history. This unforgettable time would become an inherent part of our heritage and have a pronounced and resounding effect on the history of music in America. With 2013 being in the middle of the American Civil War’s 150th Anniversary observation, these revival bands, plus other historical bands from the East Coast and South, will present an important focus for the Festival. While the bands will perform their own concerts on all of the Festival days, a Battle of the Bands will take place Saturday, Aug. 3, at noon along the banks of the Cannon River. A Massed Civil War Bands Concert will follow at 1 p.m. on the 4th Street Bridge, completing the Civil War Anniversary Day of the Festival. Another ensemble that will relive music of the 19th Century is the Independent Silver Band of Mount Vernon, Illinois. Back in its heyday of the 1880s, the community enjoyed first-class entertainment and boundless enjoyment as the band played for balls, picnics, parties and political rallies. By bringing together interested brass players and percussionists from Mt. Vernon and the surrounding area, William L. Reynolds created a modern band dedicated to playing music of a bygone time. With their stylish green uniforms, unique helmets, and a living history show with narration, they will be coming to Northfield to entertain for a second time. New to the festival this year is the most local of the Midwest groups: the Century Brass Band from Minneapolis-St. Paul. Formed recently, “Century” follows the traditions of Minnesota bands of yesteryear and uses all original music from 150 years ago. Brass bands have been important in Minnesota since the 1850s. The Great Western Band was active as early as 1858. The St. Anthony Brass Band played for the grand opening of the suspension bridge over the Mississippi in St. Anthony in 1863. In 1861, the Red Wing brass band played as Civil War volunteers departed for Fort Snelling. When soldiers returned after the war, the Great Western Band greeted them at the St. Paul train station. The Century Band calls on this rich heritage for its inspiration. For more information, tune into our news blog at http://vintagebandfestival.org/news/. Find the VBF on Facebook at “Vintage Band Festival” and Twitter at @vintagebandfest. This entry was posted in Itineraries for Visitors, VBF News and tagged 1st Brigade Band, Abraham Lincoln, American Civil War, Century Brass Band, Dodworth Saxhorn Band, Independent Silver Band, Northfield, U.S.-Dakota War of 1862 on April 24, 2013 by Paul Niemisto.